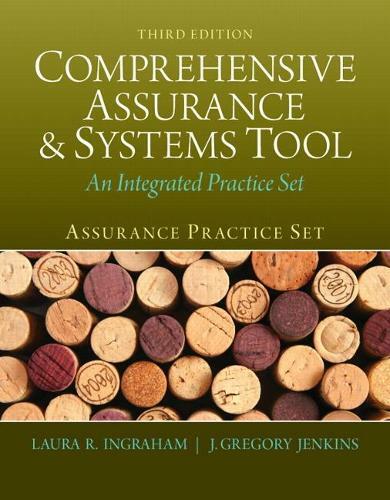 Comprehensive Assurance and Systems Tool (CAST) provides an integrated learning opportunity that encompasses financial statement assurance and accounting information systems. CAST uniquely exposes readers to these issues at The Winery at Chateau Americana, a hypothetical company that is based on an actual domestic winery. Readers will develop a rich knowledge and understanding of Chateau Americana and its industry as they provide assurance on the company's financial statements and address a variety of challenging accounting information systems issues. The third edition has been updated in response to the changes that have occurred in the accounting environment, in technology, and in response to the many helpful comments and suggestions we have received from readers. Specifically, the authors have incorporated new transactions in the Manual Module that are intended to reinforce more advanced accounting transaction processing. In the Computerized AIS Module, the authors have provided more advanced Macro instruction and additional PivotTable practice.